It's possible that your backend runs on a different server than your web server. The problem is that sometimes you have to render certain views or even send emails from your backend (ex. reset password token) but you don't have access to the MVC framework (System.Web.Mvc). How do you solve it? 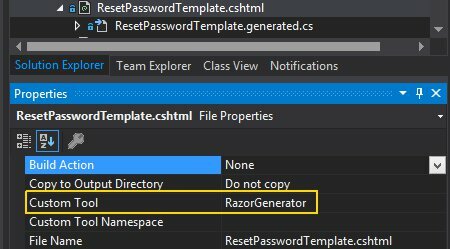 In Asp.Net, a solution to that would be using the RazorTemplate nuget package. Let's take a look. RazorTemplates is an open source templating engine based on Microsoft's Razor parsing engine. Thread safe. Allows running Razor templates outside ASP.Net MVC Projects. For reference, the github page is located here. Once added, it's time to create your views. Simply create a csthml in your non-web project as you would create any other file type, suffixing it with cshtml. Note that here my model is dynamic so I'm not required to have a strongly typed model. After the above code is run, TransformText returns you a string with the rendered content. You can then email that string or create fancy reports from your backend. To Asp.Net core users, Microsoft just released a similar approach to Razor UI in class libraries. We will explore that feature in the blog in the future.